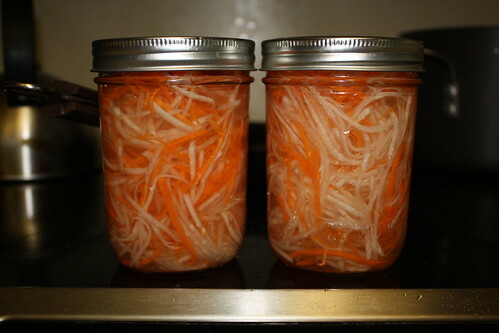 Try this daikon and carrot pickle recipe once and then tweak the recipe to your liking. Variations include adding tangy-sweet-pungent pickled shallots to the mixture, as well as making heavier on the carrot side than the daikon side. I prefer to keep a ratio of say 2:1 of daikon to carrot as I like the mild bite of daikon radish. I like a tangy-sweet flavor whereas you can alter the ratio of sugar to vinegar to make the brine sweeter, and hence affect the pickle’s flavor. 1. Place the carrot and daikons in a bowl and sprinkle with the salt and 2 teaspoons of the sugar. Use your hands to knead the vegetables for about 3 minutes, expelling the water from them. They will soften and liquid will pool at the bottom of the bowl. Stop kneading when you can bend a piece of daikon so that the ends touch but the daikon does not break. The vegetables should have lost about one-fourth of their volume. Drain in a colander and rinse under cold running water, then press gently to expel extra water. Return the vegetables to the bowl if you plan to eat them soon, or transfer them to a 1-quart jar for longer storage. 2. To make the brine, in a bowl, combine the 1/2 cup sugar, the vinegar, and the water and stir to dissolve the sugar. Pour over the vegetables. The brine should cover the vegetables. Let the vegetables marinate in the brine for at least 1 hour before eating. They will keep in the refrigerator for up to 4 weeks. Beyond that point, they get tired. First of all, wash your leeks real good. Leeks are in the garden a long long time. 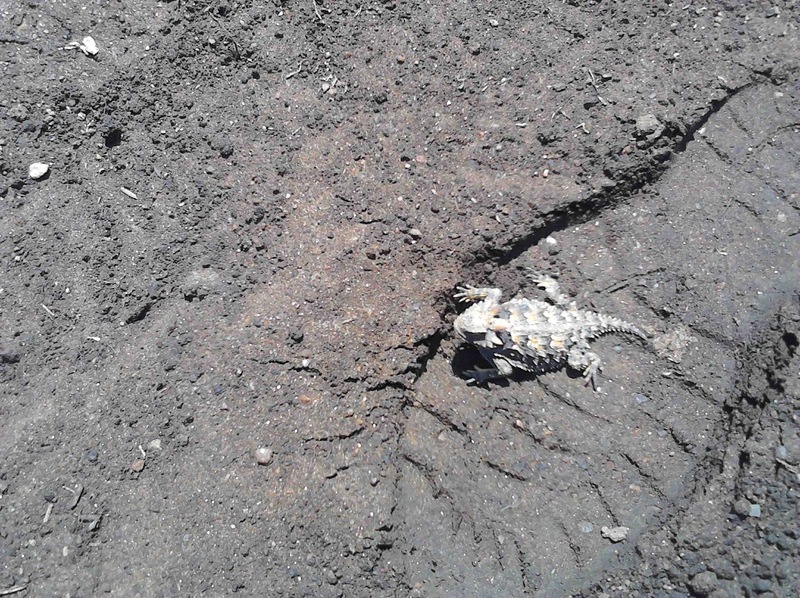 It is not uncommon that each section will have some grit at the base where the leaf meets the stalk. Cut them in half longwise and then hold them under water for a good rinse. lay the leeks out in a 9×9 baking dish. Give a thought about what else you might throw in there from this weeks box. Daikon bakes up nice actually. Green onions and leeks are practically kissing cousins, so that one is a no brainer there. Once you have laid out your veggies, generously pour olive oil over the top. Add a few tablespoons of red wine and grate some parmesan and sprinkle it over the veggies. Put some course pepper and your favorite herb. Cook for one hour at 350 degrees. Serve next to potatoes or risotto.